We now have the spare wheel secured onto the rear rack, which I’m sure will prove to be invaluable when it comes to changing wheels in anything other than a perfect environment. The wheel ( all 135kg of it), is mounted in a nice upright position, and is tucked back nice and tightly to the vertical sliding mechanisim of the galvanised rack. 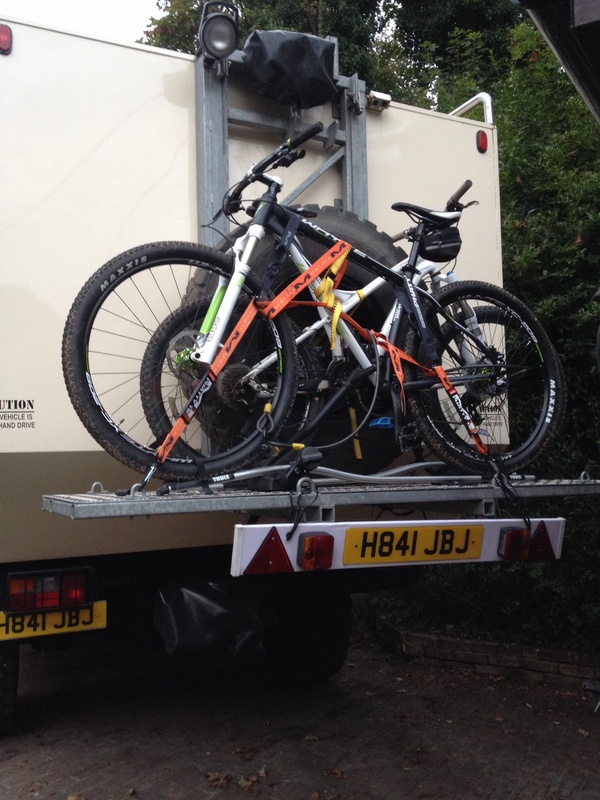 This has left a decent amount of room for us to carry both mountain bikes, nicely secured in the lockable cycle holders, without even having to remove the pedals. Where the the spare was originally located, we have had a aluminium storage locker made up to fit in the space. 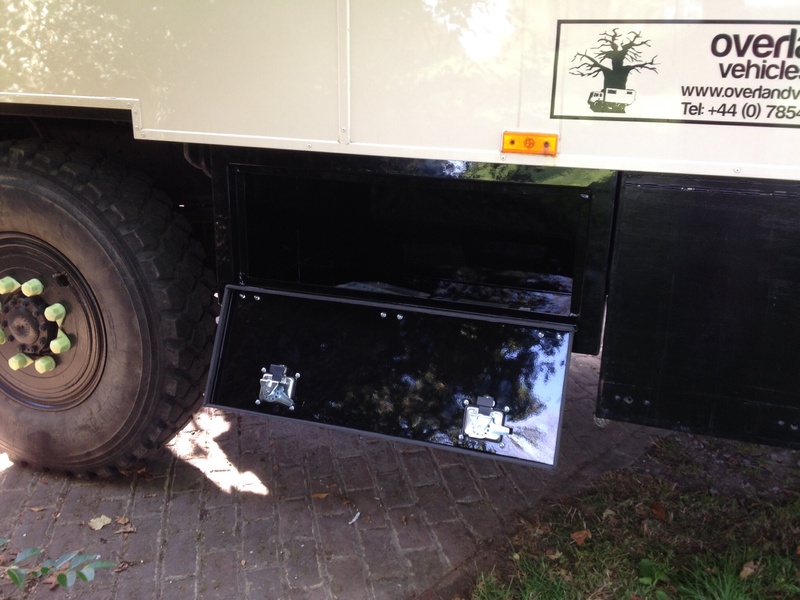 We went with a company called Metallics Uk, to make this up, the sizes are 1040mm long, depth from front to back is 500mm and is 450mm high, we have had this black powder coated, and it is fitted with stainless steel locking handles and hinges. It is fitted with a waterproof/dust proof seal and is a thing of beauty! I’d recommend this company for anyone that wants something fabricated from Aluminium or Steel, and the owner Richard was a great guy to deal with. 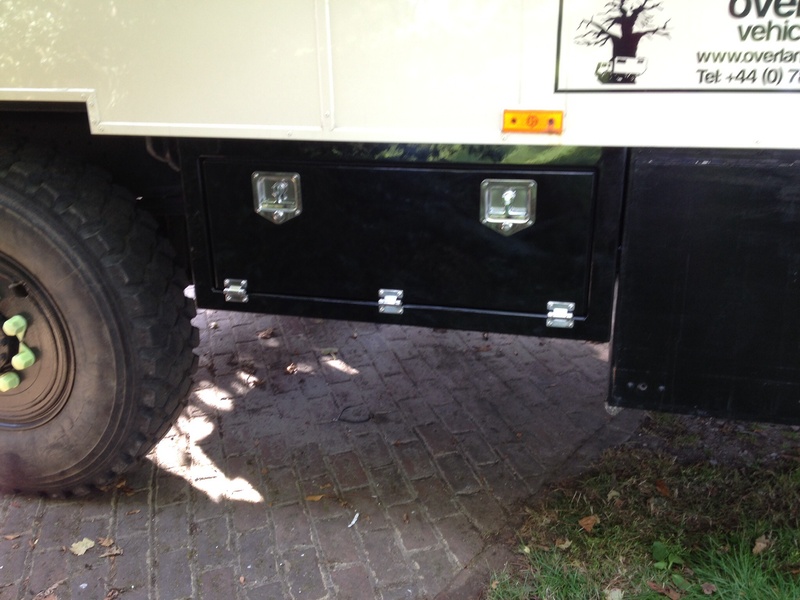 I had Glen weld up a couple of angle irons to the underside of the chassis with some bolts drilled and welded to the steels, then the top of the locker was drilled and offered up to the captive bolts, then with a small amount of brute force, and help from a local, it fitted lovely! All fully bolted up and ready to go.